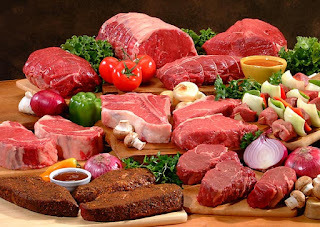 When it comes to cutting down on fats,many a times it becomes difficult to do for many of us mainly due to the high consumption of meat.However if one choose wisely and takes care as to what type and cut of meat one is consuming, the task becomes much easier. Choose lean meats and poultry without skin and prepare them without added saturated and trans fat.Most meats have about the same amount of cholesterol, roughly 70 milligrams in each three-ounce cooked serving (about the size of a deck of cards). The American Heart Association recommends eating no more than six ounces of cooked lean meat, poultry, fish or seafood a day. The leanest beef cuts usually include sirloin, chuck, loin and round. Choose "choice" or "select" grades rather than "prime." Select lean or extra lean ground meats. Lean pork cuts include tenderloin or loin chops. The leanest lamb cuts come from the leg, arm and loin. Remove all visible fat from meat and poultry before cooking. Choose white meat most often when eating poultry. Duck and goose are higher in fat than chicken and turkey. Grill, bake or broil meats and poultry. Organ meats — such as liver, sweetbread, kidneys and brains — are very high in cholesterol. Cut back on processed meats that are high in saturated fat and sodium.